Right now is the warm up before the big race. The soil in the gardens is either frozen or too mushy to dive into, but I am at the start line ready for the precise moment when it is thawed and dry enough to dive into. My trowel, claw, pruners and favorite shovel are with me. I remind myself AND SHEBA that we need to stay out the beds just a little but longer. Perhaps in as soon as a week I will be able to cross the start line into the mad dash which is spring in northern New England. While I wait at the start line, I scribe my dreams. No trip through the gardens is complete without crumpled notes and Grace and Sheba careening around the paths. Any pause is a chance to search for new life and early Flowers. 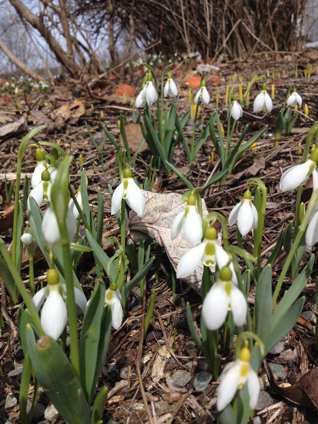 Due to my exuberant plantings of Snowdrops, almost anywhere we stop there are Snowdrops at our feet. Such bliss after six eight nine months of winter. 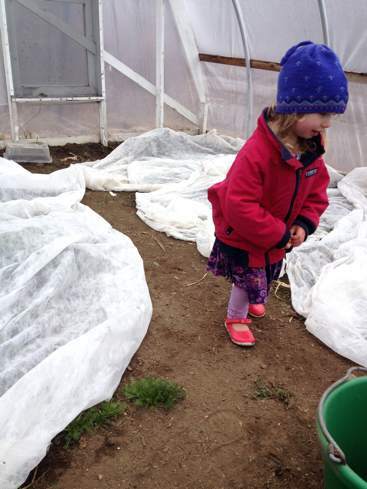 This is our first full spring with a hoop house on the property. It is a delirious experience for me. Every square inch is glorious green already. Because I call the seedlings “baby plants,” Grace thinks she needs to be quiet so these babies can sleep. This morning she lifted up the frost cloth still covering the plants and made a shhhhhh sound to Sheba. Of course Sheba ignored Grace. Spring is spring, and a dog’s got to celebrate with wild loops in fields and a fair bit of barking. Every flat surface in the office, greenhouse and kitchen is covered in seed flats but that still leaves me searching for various perennials online that I can’t grow from seed. When I placed several orders last week, I noted that I have a greenhouse, a hoop house AND cold frames so please, send the order NOW. Nonetheless, someone from every company called me back to say that they didn’t want to send the plants until the middle of May. I had to beg and plead to get them to release the plants. Fingers crossed they will arrive any day. During phone calls like this, I clutch my well loved catalog from the long defunct Roseraie at Bayfields in Waldoboro, ME. The man who ran this place, Lloyd Brace, was more than a bit of fresh air. He had so much genuine wisdom about Roses that whenever I am arguing with someone about sending me the Roses I ordered, I think of how Lloyd said to plant them as soon as the ground could be worked. As in the moment the ice is gone and the soil is not too soggy. Like NEXT WEEK not the end of May!!!! During the years I got Roses from Lloyd Brace, I would plant the Roses right on Lloyd’s schedule. I will do this again this year if anyone believes me and sends the Roses when I asked for them. I can’t wait to get busy in a few days digging those holes!